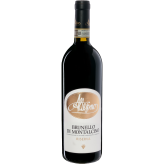 Brunello stands out from other Sangiovese-based Tuscan reds, such as Chianti and Vino Nobile di Montepulciano. 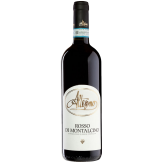 Perhaps this is because it is made from a single Brunello clone of Sangiovese, while the others are blends of multiple Sangiovese clones. For the better part of the last century, however, Montalcino was a poor Tuscan town, known best for Moscadello dessert wines and neglected vineyards. Altesino is among a handful of Brunello producers who pushed for increased quality and recognition in the 1970s and 1980s, revolutionizing the region entirely. After purchasing his property in 1970, Giulio Consonno and his collaborators began several years of experimentation. They were convinced that the strict aging requirements for Brunello di Montalcino were preventing them from making the best wine they could. The found that the strong, tannic wines obtained from their grapes do not show their best potential when subjected to 3 1/2 years of aging in bottle. Instead, putting these same wines into small French oak cooperage for shorter periods of time brought out the fruit, softened the tannins and resulted in perfectly balanced wines. A string of classic wines followed, and Altesino established a style characterized by finesse, elegance and rich, vibrant fruit tones.